You can get involved with SPEAR in a variety of ways. Support from the local community is what has enabled SPEAR to keep helping people suffering from homelessness for 30 years and our work wouldn’t happen without you! So whether you are an individual looking for a charity to support, a company, school, community group, trust or faith group – we welcome your support. For more information on how we are supported by these different groups, please click on the relevant page in this section. We also have a range of downloadable resources on our Fundraising Resources page. Click here for the practicalities of the Ways to Donate Money whether it be directly, through fundraising, a bank transfer or cheque. 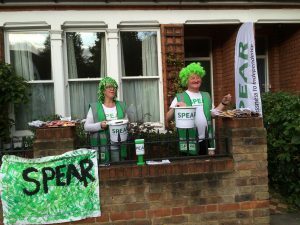 Or contact the fundraising team on: supporters@spearlondon.org to discuss further how you might get involved. We also send our regular newsletters if you wish to receive this. Charity Reg No. is 1122206 | 020 8288 6506 | admin@spearlondon.org | 9 Briar Road, Twickenham, TW2 6RB.